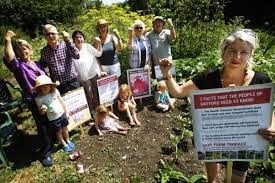 With Parliament now in a period known as purdah, the decision regarding the deregulation of Farm Terrace Allotments has now been delayed until after the general election. With this in mind, +Sara-Jane Trebar discusses this and gives an update to the campaign, her petition and a similar situation happening in Coombe, Kent. +Chris Ogle also interviews Sara a few months ago in regards to the campaign and the video is below for a summary of the situation if anyone is unaware of the campaign and why they are fighting against Watford Borough Council's decision.